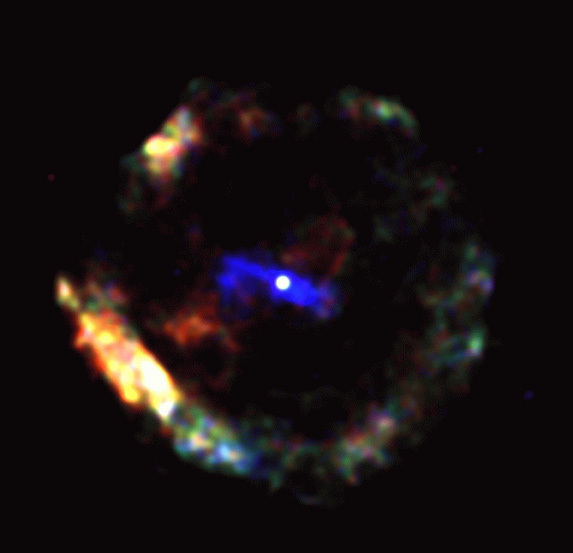 This Chandra image clearly locates a pulsar exactly at the geometric center of the supernova remnant known as G11.2-0.3. Chandra provides very strong evidence that the pulsar was formed in the supernova of 386 AD, which was witnessed by Chinese astronomers. Determining the true ages of astronomical objects is notoriously difficult, and for this reason, historical records of supernovas are of great importance. If confirmed, this will be only the second pulsar to be clearly associated with a historic event. Since pulsars are known to move rapidly away from where they are formed, Chandra's ability to pinpoint the pulsar at the center of the remnant implies the system must be very young, since not enough time has elapsed for the pulsar to travel far from its birthplace. The Chandra observations of G11.2-0.3 have also, for the first time, revealed the bizarre appearance of the pulsar wind nebula at the center of the supernova remnant. Its rough cigar-like shape is in contrast to the graceful arcs observed around the Crab and Vela pulsars. However, together with those pulsars, G11.2-0.3 demonstrates that such complicated structures are ubiquitous around young pulsars. Chandra observed G11.2-0.3 with the Advanced CCD Imaging Spectrometer at two epochs: August 6, 2000, and October 15, 2000, for approximately 20,000 and 15,000 seconds respectively. Scale Image is 5.8 x 5.4 arcmin across.